The are many different ways to drain water from a kayak. The original methods of modern kayaking had the flooded kayak kept in the inverted position during the draining process until the cockpit was empty. 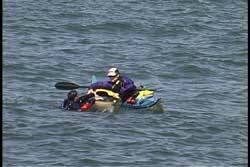 Then the kayak was turned upright so the paddler in the water could enter their kayak again. Here is a great story that illustrates this idea. On Christmas Morning the husband asks his wife why she just cut the tip of the roast off before putting it into the roasting pan. She said she learned it from her mom, but never asked her why. The husband being a curious sort called his mother-in-law and asked her. She told the husband she had learned it from her mom, but didn't know why. The same answer came from the grandmother. Fortunately the great grandmother was still alive and still cooking. When the husband called her and asked, she paused on the phone and then said, "When I was younger I only had one size roasting pan. The roasts we got were usually larger than the pan so I would cut off the tip so there wouldn't be any juices falling off into the oven. I guess my daughter used to see me do it and never asked why." Now that you know the history, we will set the stage with a quick review of a traditional recovery and the way water is emptied from a flooded kayak. 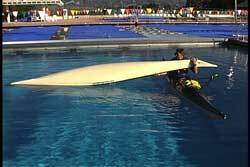 When the swimmer jumps on the stern it helps lift the bow of the flooded kayak so the assisting paddler can pull it across their boat. Once the bow of the flooded kayak is in the hands of the assisting boater, that boater will drag the kayak across their kayak and drain the water from the cockpit of the flooded kayak. See USK article, "TX-Recovery." As a side note, it is interesting to mention that even after bulkheads were installed in kayaks many instructors still taught the original techniques, even though certain steps no longer made sense. The TX drain was still being used until some common sense paddlers realized that just using a T-drain would serve the purpose if there was a rear bulkhead. See USK article, "T-Recovery." 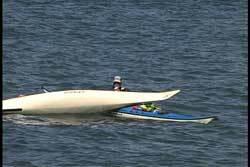 In this example the kayakers are using my recommended position, which is a bow to stern configuration. I feel this position keeps the assisting paddler out of the way of the cockpit and also provides them with more option if they need to assist the paddler in the water. 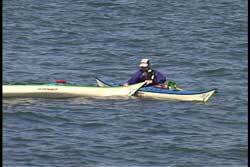 This position also allows the assisting boater to keep their eyes on the other paddler during the re-entry process. The will end up facing each other when the second boater is in their cockpit. 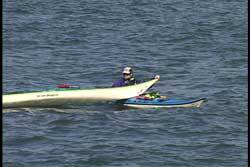 See USK article, "Walking A Kayak" for more information about moving kayaks into desired configurations.